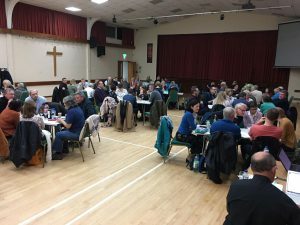 This year, we gave our annual fundraising quiz a bit of a makeover…now re-named Wisdom & Wine, there was certainly a lot of wisdom present when it took place on Saturday night – plus a fair amount of wine too! Geoff Morris, our experienced quiz-master, led the 13 teams in 8 rounds of questions on a wide variety of topics, from World War 1 to music, with a round based around the name ‘Robert’ too! Where else can you get a whole evening’s entertainment for that cost?! Great work team, and especially from the quiz master! It was a very enjoyable evening, just the right length. In total, we raised £682.70 through tickets, refreshments and running a Treat or Treasure game. These funds will help support our work in over 100 local primary and secondary schools. Thank you to Newport Pagnell Baptist Church for the excellent venue, and thank you to all who were able to be there and make the night a success. Look out for next year’s date and put it in your calendar – hope to see you then!